I use these the most of all my pro-life material. I include one in all the anniversay or birthday cards I send to our friends, family and church members. Works great as a small gift to our volunteers too. The round magnets are wonderful, with such beautiful images and positive messages! 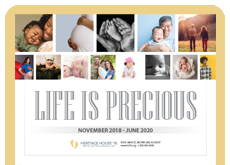 I pass them out at our parish's ministry fair, as well as at other pro-life events. Because our ministry fair is attended by families, I tend to keep magnets with positive, uplifting messages like this one that parents won't mind their children having. 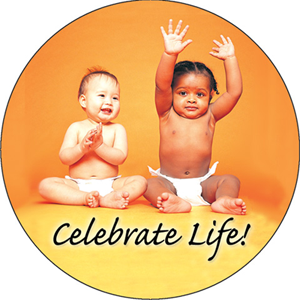 The pro-life banquet I helped with this spring was titled "Celebrate Life", so we gave away a lot of these!